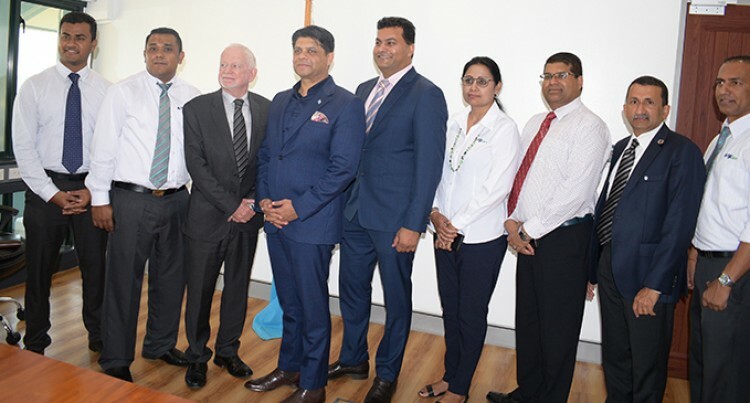 The Attorney General Aiyaz Sayed-Khaiyum after the signing of insurance partnership between the Fijian Government and FijiCare on August 29,2018.Photo:Simione Haravanua. The Attorney-General and Minister for Economy Aiyaz Sayed-Khaiyum yesterday signed the documents which will start the insurance scheme covering 107,417 Fijians as announced in the 2018/2019 National Budget. During the signing at the Ministry of Economy in Suva, between the Fijian Government and the FijiCare Insurance Limited, Mr Sayed-Khaiyum said the insurance scheme would cover 72,376 social welfare recipients and 35,041 civil servants. This includes the Fiji Police Force, the Republic of Fiji Military Forces and the general civil servants and others in the independent bodies who are now covered under the scheme. Mr Sayed-Khaiyum said the insurance would have the coverage for expenses like for funeral, fire, personal injury and death (the death payment is applicable to the age of 70). “Such package has also extended to farmers in the sugarcane sector, rice, dairy and copra farmers,” he said. “It’s not a very expensive product or giving super-duper coverage, but the fact is that it’s a coverage that many people do not have. “From the Government’s perspective, we are also ensuring that we are covered ourselves. “Because those people, who are currently on social welfare, do fall through crisis or there is some sort of hardship or their house burned down or if there is a death in the family, then they will come to the Government. “And by having this insurance cover, we are able to instantly react to their situation and through this insurance scheme, we are able to provide them with the cover,” Mr Sayed-Khaiyum said.